Microsoft has announced that developers can now build native 64-bit Arm applications for Windows 10 on Arm devices. In a blog post the company said that such apps can be compiled from the new Visual Studio 15.9 software development suite. Furthermore, the latest Visual Studio will allow developers to re-compile both UWP apps and C++ Win32 legacy programs for Arm64. Microsoft is accepting these apps now for inclusion in the Microsoft Store. Previously native Arm applications for Windows 10 were 32-bit only. Additionally, x86 applications all used an emulation layer to run on the Arm hardware - resulting in sluggish performance compared with what a native app could accomplish. Emulation might also impact a device's touted super-long battery life by adding processing overheads. Microsoft says recompiling will make a big difference with native Arm64 apps taking full advantage of Windows 10 for Arm. In particular, the blog notes that the newer second-generation Arm machines running Windows 10 (like Lenovo and Samsung machines using an SD850 SoC) combined with native 64-bit Arm applications should offer "a much improved experience". Of course this change will occur only if, and when, apps are recompiled - and some developers might not get around to it, as many haven't got around to releasing 64-bit versions of their programs, for example. On the developer side of things the aforementioned Visual Studio 15.9 needs to have a component called 'Visual C++ compilers and libraries for Arm64' installed to enable the (re) compilation target - see screen shot above. 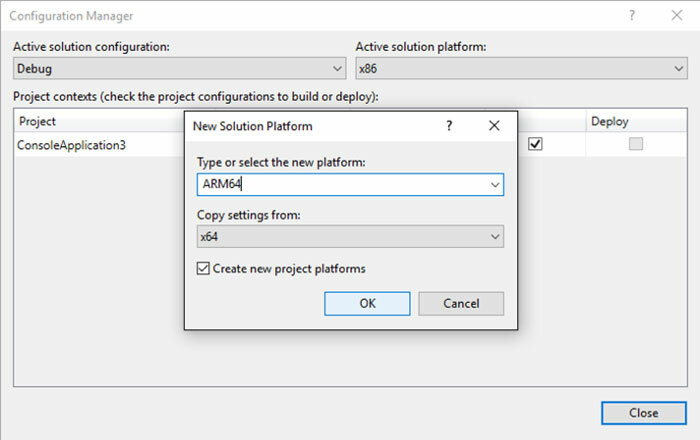 After this is added you will see Arm64 as an available build configuration. Existing projects will need an Arm64 build configuration adding as per Microsoft's instructions. Currently Windows on Arm machines are facing a common problem seen on newer platforms. As there are relatively few such machines out there developers aren't motivated to consider them when releasing their apps. However, those that cater for these early Windows on Arm adopters will likely be appreciated and enhance their app store presence and ratings.